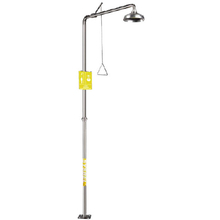 The latest shower developed by SYSBEL is composed of the spraying header plate and shower head. Water can be uniformly scattered by the vortex shower on the inner wall of the shower head, and sprayed along the arc of the inner wall in the tapered spout form, so the body can be gently flushed with plenty of water, without harm. To a certain degree, harmful substances can be rapidly and efficiently flushed away under emergency conditions. This series of products fully complies with ANSI Z358.1-2014 and AS 4775-2007, and has been tested and approved by CSA. • The unique nozzle design is adopted.T he same height can be maintained under certain water pressure ,to avoid the operating obstacles caused by water pressure. • The nozzle can be used for spraying two kinds of water at the asme time, with balanced heights. The water flow is steady and uniform due to the built-in flow limiter. 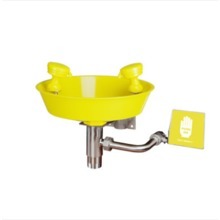 • The bubbler with a coin slot is easy to remove and install, and thus simple to clean and maintain. • The dust-proof cover can protect the nozzle from being contaminated by dust in the air. Once the eyewash is started, the dust-proof cover will be opened automatically under water flow. • The copper nut is built in the 304SS nozzle base and connected to the horn elbow, and its strength is enough to allow repeated removal and installation and ensure longer service life. • The nozzle is made of AES engineering plastic which is superior to ABS engineering plastic, and has outstanding features of weather resistance, high rigidity, corrosion resistance, UV resistance, etc. 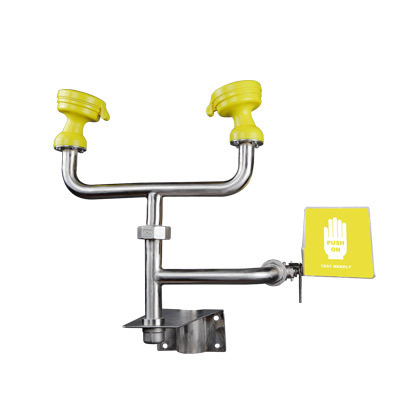 • The main fittings and other accessories are made of 304 stainles steel and applicable to adverse workplaces. • The bright yellow plastic is used to facilitate observation and identification. • The quick connector is equipped with a built-in filter to prevent debris or impurities from flowing into the nozzle, in order to avoid secondary damage to the eyes. Inaddition, the connector is easy to operate, which is conducivef or cleaning and maintenance on a regular basis. 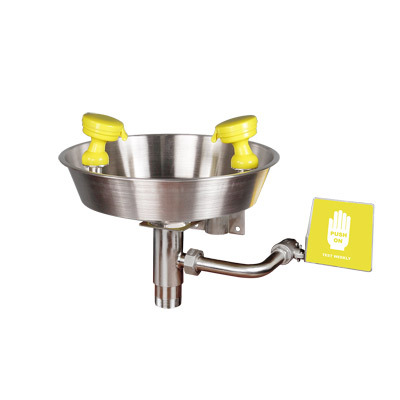 • The eye/face wash series fully comply withA NSI Z358.1-2014 and AS 4775-2007, and has been tested and approved by CSA. 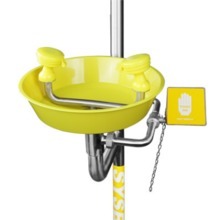 Shanghai SYSBEL, adhering to innovation, is known as one of the leading wall mounted eye wash system manufacturers and suppliers. Offering you competitive price, welcome to buy the quality and highly effective products for sale with us.